Indian government and media have made a series of false claims about Balakot "militant casualties" and "shooting down Pakistani F16". Both of these claims have been scrutinized and debunked by independent journalists, experts and fact checkers. There is no dispute about the fact that Squadron Leader Hasan Siddiqui of Pakistan Air Force (PAF), flying a Pakistan-made JF-17 fighter, shot down Wing Commander Abhinandan Varthaman of Indian Air Force (IAF) flying a Russia made MiG 21. Abhinandan was captured by Pakistan and then released to India. Indian government and media claimed that an Indian Air Force pilot shot down a Pakistani F-16 on February 26, 2019 over Kashmir. This claim and the evidence offered were examined by Belling Cat, a fact-check site that successfully investigated the downing of a Malaysian passenger jet over Ukraine. Belling Cat's Veli-Pekka Kivimäkithere concluded that "no compelling evidence offered as of yet that an F-16 would have been shot down, and all signs point to MiG-21 wreckage having been on display thus far". Abhijit Aiyar Mitra, an Indian aviation expert participating in an India Today TV Show, embarrassed the show host on a live show when asked to identify a wrecked engine as being an F-16 engine. The expert correctly stated that Pakistani F-16s are equipped with Pratt and Whitney engines and what the TV host was calling a Pakistani F-16 engine was made by a different manufacturer. Both Kivimäki and Mitra concluded that the image offered as evidence of Pakistani F-16 engine was in fact from a MiG 21 wreckage. Announcing the Indian air strikes in Pakistan, Indian Foreign Secretary Vijay Gokhale claimed the strike killed “a very large number of Jaish-e-Mohammad terrorists, trainers, senior commanders, and groups of jihadis who were being trained for Fidayeen action were eliminated.” Another senior government official told reporters that about 300 militants had been killed. The Indian government claim was soon followed by a video clip purportedly capturing a portion of that air strike on social media. Fact Check site snopes.com analyzed this video and declared the Indian claim "false". People in the area said Jaish-e Mohammad did have a presence, running not an active training camp but a madrassa, or religious school, less than a kilometer from where the bombs fell. “It is Taleem ul Quran madrassa. The kids from the village study there. There is no training,” said Nooran Shah, another villager. There is no dispute about the fact that Squadron Leader Hasan Siddiqui of Pakistan Air Force (PAF), flying a Pakistan-made JF-17 fighter, shot down Wing Commander Abhinandan Varthaman of Indian Air Force (IAF) flying a Russia made MiG 21. Abhinandan was captured by Pakistan and then released to India. All of the Indian claims about "JeM militant casualties" and shooting down of Pakistani F-16 have been debunked by independent fact-checkers and foreign media reporting on it. Villagers in Balakot told Reuters that "Only some pine trees died, they were cut down. A crow also died.” Belling Cat's Veli-Pekka Kivimäkithere and Indian analyst Abhijit Mitra have said that the images of the wreckage being offered as proof of downed F-16 are in fact from MiG-21. 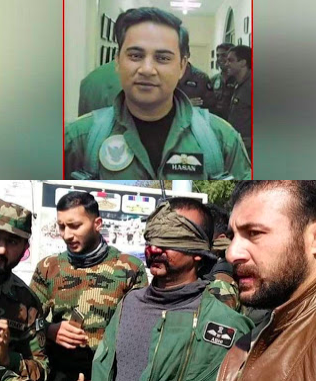 There is no dispute about the fact that Squadron Leader Hasan Siddiqui of Pakistan Air Force (PAF), flying a Pakistan-made JF-17 fighter, shot down Wing Commander Abhinandan Varthaman of Indian Air Force (IAF) flying a Russia made MiG 21. Abhinandan was captured by Pakistan and then released to India. Who Won the 1965 War? India or Pakistan? Indian Prime Minister Narendra Modi has suffered badly after his military's failures in Balakot and Kashmir. Not only did Indian air strikes fail but India lost aircraft and had one of its pilots captured by Pakistan. India wants to go to war with Pakistan but they are in catch 22 now. Fortunately the circumstances are not moving forward in their favor and India is provoking Pakistan to justify aggression and isolate Us. Danger of war is hanging due to arrogance. There was no weapons of mass destruction; yet Iraq has to suffer from a long war. Similar formula is being devised by India. But Pakistan is not Iraq and India is not USA. I am very optimistic that we are heading to right direction and every hour Indian Camp is being pushed in corner. For nearly a decade India has also been the world’s top importer of arms. In terms of active manpower and the number of ships and planes, its armed forces are already among the world’s top five. Measured by ambition, India may rank higher still. Its military doctrine envisages fighting simultaneous land wars against Pakistan and China while retaining dominance in the Indian Ocean. Having revealed its nuclear hand in 1998 with a series of tests, India has developed its own ground-hugging cruise missiles and is trying to perfect submarine-launched intercontinental ones, too. Since the Hindu nationalist party of the prime minister, Narendra Modi, took power in 2014 it has also adopted a more muscular posture. Last summer it sparred with China atop the Himalayas in the tensest stand-off in decades. It has also responded to cross-border raids by militant groups from Pakistan not with counterinsurgency tactics and diplomatic ire, but with fierce artillery strikes against Pakistani forces. India’s armed forces are in alarming shape. It was an inauspicious moment for a military the United States is banking on to help keep an expanding China in check. The pilot made it home in one piece, however bruised and shaken, but the plane, an aging Soviet-era MiG-21, was less lucky. The aerial clash, the first by the South Asian rivals in nearly five decades, was a rare test for the Indian military — and it left observers a bit dumbfounded. While the challenges faced by the India’s armed forces are no secret, its loss of a plane last week to a country whose military is about half the size and receives a quarter of the funding was still telling. “Our troops lack modern equipment, but they have to conduct 21st-century military operations,” said Gaurav Gogoi, a lawmaker and member of the Parliamentary Standing Committee on Defense. American officials tasked with strengthening the alliance talk about their mission with frustration: a swollen bureaucracy makes arms sales and joint training exercises cumbersome; Indian forces are vastly underfunded; and the country’s navy, army and air force tend to compete rather than work together. Whatever the problems, the United States is determined to make the country a key ally in the coming years to hedge against China’s growing regional ambition. Last year, when Defense Secretary Jim Mattis announced that the Pentagon was renaming its Pacific Command — to Indo-Pacific — he emphasized India’s importance in a shifting world order. One of the senior U.S. defense officials with direct knowledge of the count said that Pakistan invited the United States to physically count its F-16 planes after the incident as part of an end-user agreement signed when the foreign military sale was finalized. Generally in such agreements, the United States requires the receiving country to allow U.S. officials to inspect the equipment regularly to ensure it is accounted for and protected. Some of the aircraft were not immediately available for inspection due to the conflict, so it took U.S. personnel several weeks to account for all of the jets, the official said. Some people say the US knows it lost an F-16 but can’t admit it for commercial/pride reasons. Let me just say that Pakistan has many enemies in the US bureaucracy and even more on the Hill, and I think if Pakistan lost an F-16 they would gleefully leak it. IAF claim of hitting F-16 by their Mig 21 before having been shot down by PAF gets exposed. All 4 missile seeker heads recovered intact from the wreckage & held. Pakistan and its professional Armed Forces staying humble by not drum beating. We have more truth on this to share.